It walks a fine line between comedy and drama and excels at both without compromising either. Winter 1914 on the front lines of WWI in German-occupied France. The Germans are fighting against the French and the Scots, who are allied together. It is a continual struggle of trench warfare with assistance from rear artillery. The soldiers are all within close proximity to each other as they battle over this scrap of land. Huddled in their trenches on a cold Christmas Eve, the men try to make the best of the time. It is all quiet along this western front, when the voice of a German tenor breaks the silence. The Scots answer back on bagpipes. Enemies only hours ago and each responsible for the deaths of their comrades, they become connected through music. As they find a common Christmas carol to perform together, the tenor leaves his trench and approaches the Scots with his arms outstretched. Everyone is startled and confused, unsure of what to do as he makes his way across the deadly no-man's land, yet the music continues. As the song ends, the German lieutenant and his Scottish counterpart talk. The French lieutenant leaves his trench to see what's happening. Considering all the generals are home in their warm beds after having eaten grand meals, the three take it upon themselves to declare a Christmas armistice. The trenches empty as the soldiers greet each other. The Scots share their whiskey, the French their wine, and the German their chocolate. They also share stories of families back home, and these bitter rivals quickly discover how much they have in common. Bonds are formed and arrangements for reunions after the war are made, leaving the viewer to wonder what will happen tomorrow when their superiors order the war to be resumed. Writer/director Christian Carion's Joyeux Noel walks a fine line between comedy and drama and excels at both without compromising either. What could have become a wacky, wartime comedy, a la Hogan's Heroes, develops into a poignant drama filled with humorous moments. The story has many wonderful, subtle revelations of character and plot for those that pay attention, adding layers of depth to the exposition without drawing attention to it. What is most remarkable is that the film is based on true events. The strength in the writing is also illustrated by the fact that the script handles a large ensemble well. The characters are memorable instead of the usual generic soldier stereotypes that we've seen a million times before, like in Saving Private Ryan. For example, one French soldier, whose home is under German occupation, has an alarm set to ring at 10 a.m. every morning, the time he used to have tea with his mother. He does this so no matter how stressful and maddening the war gets he won't forget her. The actions and motivations of all the characters are believable and their humanity simultaneously creates hopefulness for mankind's potential and a frustration with its progress. 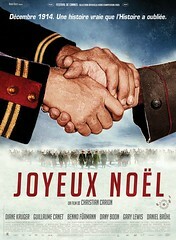 Joyeux Noel was France's official entry for 2006 Academy Awards Best Foreign Language Film. It deserved to be considered for Best Picture.